There is a lot of talk about which bike share programme is the best - Bixi, Vébib, Velov, Bicing, etc - but what about the worst? I think I found the answer on a visit to Capitol Hill, in Washington, DC. Wheels4Wellness. Appropriately, the World's Worst Bike Share Programme has a goofy name. Now I like the use of bicycles as a symbol. More bicycles on the streets, more bicycle pictograms on bike lanes, cycle tracks and other dedicated infrastructure, as well as on streets and so on are important symbols to show that bicycles are back and are here to stay. It's basic visibility and branding. The 30 bikes in the Wheels4Wellness programme are available to people working on the House side of the Capitol. They are available at six locations and you can use them for up to 12 hours. At this point it sounds reasonable. To sign up for the programme you can register at the House Staff Fitness Center [presupposing, perhaps, that only fitness freaks would consider using them?]. Accessibility is the main want. To borrow one for a quick trip to lunch or a meeting involves going over one location to get a key and then walking back to one of the locations to pick up a bike. There's goes your lunch hour right there. And in the photo above you can see that access is no easy task. The bikes are in a parking lot. I couldn't even get in to see them. You have to walk down to the entrance to the lot and then back up. The actual bicycles look fine enough but then again, it's just a bicycle so it's hard to screw THAT part of it up. It's hardly surprising that the lack of popularity of the programme was leapt upon by other politicians. I've heard conflicting reports about the scheme. One was that the people responsible didn't want to utilize the Smartbike programme because they had a deal with a bike company named Trek. The other report was that after the programme was launched, they contacted Smartbike DC and asked to be a part of it but were refused. Whatever the case, the programme gets Copenhagenize's vote for World's Worst Bike Share Programme. Difficult to use, limited user group, inaccessible, a name that lacks spice and branding. It's not like this was a pioneer initiative. There are dozens and dozens and dozens of bike share systems in cities around the world. 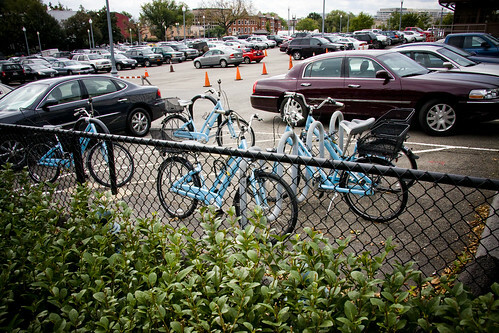 It is quite easy to at the very least adhere to the basic concept of bike sharing.